Throughout the month of March, San Mateo County Libraries is encouraging kids of all ages to drop in, roll up their sleeves, and make stuff. These days, it’s so easy to buy trinkets that are cheaply made, or to devote one’s free time to electronic devices. But sometimes it’s good to take a break from that and reset. Here’s your chance to take advantage of opportunities to engage in a variety of cool do-it-yourself projects while putting your STEAM (science, technology, engineering, art, math) skills to work. 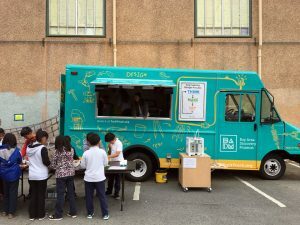 Try-It Truck From the Bay Area Discovery Museum – Join us for a visit from the Bay Area Discovery Museum's Try-It Truck! Get hands-on with both low-tech and high-tech tools. Learn about the engineering design process, take risks, and try new ideas. The Beetlelady at the Library - Learn about the differences between arthropods, insects, and arachnids, play with building your own insects, meet some fascinating live arthropods, and learn about record-breaking bugs. Learn to Sew at the Library - Have you always wanted to sew but didn't know how to start? Come learn sewing machine basics and construct a simple pillow case or other project. All materials provided. Healthy Food for Kids With Jillian Love - Be creative with food! Learn to make healthy treats and snacks with Jillian Love. Learn Needle Felting - Learn the amazing art of needle felting and make a cute cuddly bunny and other fun creatures. All materials, tips, and tricks provided. These are just a few of San Mateo County Libraries’ programs. You can see a complete list of Make It March activities or check your local library. What crafty things do you like to make at home?